Spend the week based out of large rafts as we float down the North Saskatchewan River. Along the way you will climb a mountain, try your hand at rock climbing, enjoy beautiful camp sites, and of course learn to steer a raft! 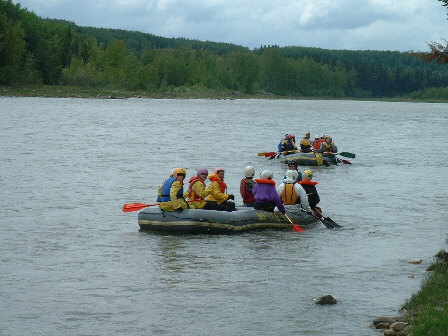 Note to Parents: As the North Saskatchewan River closely parallels the highway, COE staff can quickly reach the group in case of illness or other problems. 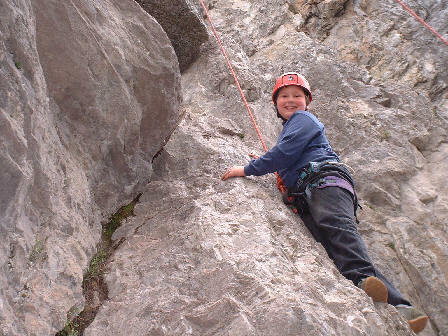 The guides on this trip are highly experienced in water safety and climbing instruction. As a result of in-depth planning, and the reasons mentioned above, we feel that this trip will run with a very high level of safety. When you arrive at COE you will spend a couple of hours getting packed and organized before heading out to our put-in point near the Banff National Park boundary. From here we will raft a short ways down the river before pitching camp for the night. The next two days will be spent hiking into and climbing a fun mountain a short distance from the river. Once we return to the rafts we will paddle down to the Kootenay plains area where we will spend the next day rock climbing. On the last day, another paddle brings us to the end of our trip at Abraham Lake. This schedule is flexible depending on weather and the specific age group of the trip. Drop off time is 4:00 pm Sunday at COE. Pickup up time is noon Saturday at COE. Please be on time. Thanks!